Explanation: The 2001 Leonid storm was so intense that the meteor shower's radiant, the point on the sky from which the fleeting trails seemed to diverge, was easy to spot. But the bits of debris that created the meteors really moved along parallel paths, following the orbit of their parent comet Tempel-Tuttle. Their apparent divergence from the shower's radiant point was simply due to perspective as skygazers looked toward the stream of cosmic debris. 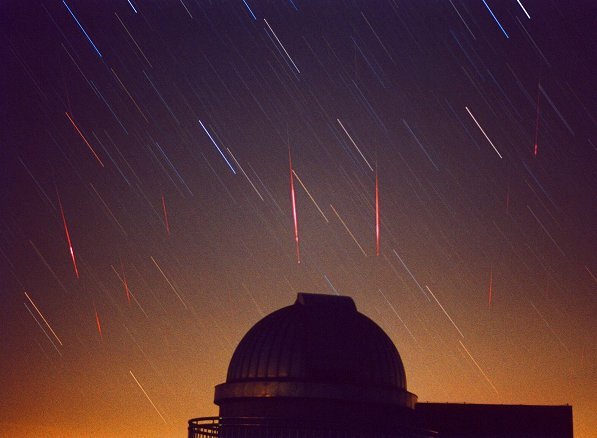 During the 2001 Leonid storm, while the radiant was above the horizon from SoBaekSan Observatory in South Korea, astronomer Christophe Marlot made this single time exposure recording star trail arcs and a number of meteors. Since Marlot was looking away from the cosmic debris stream, this perspective actually shows red tinged meteor trails converging toward a point below the horizon and opposite the radiant -- the Leonid shower's antiradiant.